With the increase in college debt and rising education costs, students need to make the right choice. It is a general perception that online schools are cheaper than traditional education. However, a thorough analysis of costs in both systems may tell a different story. There are many variables that determine the overall cost involved with each type of education. It is good for you to have prior knowledge of variables that determine the overall cost of college education. The average in-state published tuition cost at public four year institutes increased from $8,646 in 2012-13 to $8,893 in 2013‑14. In 2013-14, the average tuition fee for out-of-state students was 3.1% more than residents at four year public institutes. The average tuition fees of private non-profit four year institutes showed an increase of 3.8% from $28,989 in 2012-13 to $30,094 in 2013‑14. The cost of college education is hard to afford for many students despite billions of dollars spent in financial aid. In this case, online education can be an affordable option, but students should know how to make a correct cost estimate when going for an online program. It goes without saying that if you go for a higher level degree, the costs will be more. Associate degrees usually charge less. Online tuition costs increase when you go for higher level degrees such as bachelors, masters and doctoral. You may have to pay higher costs when it comes to quality online education. Bargains in online education can be tricky. If you are going for well reputed accredited online programs, costs are likely to be higher. As accredited institutes hire qualified professors and offer reputable programs, they charge higher costs. These costs eventually benefit students and pay off in the end with better services and quality of education. Online institutes have different parameters when tuition rates are involved. Some schools charge tuition by credit hour and some by class. The difference between these two calculation methods can be significant and if you do not consider this, you may not be able to correctly estimate your college expense. Online education does not completely free you from expenses. You may require some additional learning resources, which increases the overall cost of education. Besides, you will still need books for online education. Since online programs have varying tuition fees, the best way to estimate the cost of online education is by looking at the information provided by the institute on their website. To find out other costs, you will require some more efforts. Talking to the admission office and other students can be helpful in determining the overall cost involved. 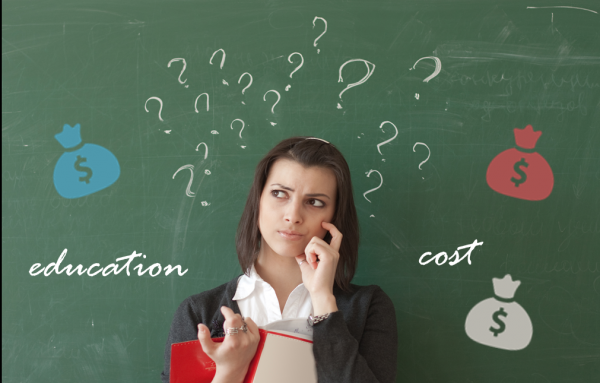 Cost is a major consideration for many students going for college education. If you have prior knowledge of costs and variables, you are much more likely to make a sensible decision. Also keep in mind that you shouldn’t compromise on the quality and repute for lower costs. Quality institutes are likely to charge a premium for their services. The extra money you spend pays off in the end. If you also have some useful tips to estimate college costs for students, feel free to share!